Networking brings NAFSA Annual Conference attendees back year after year! Unique networking opportunities, only available at the NAFSA Annual Conference & Expo, are the leading reason attendees say they continue to return each year. Attendees take advantage of sharing knowledge, gaining advice, and drawing inspiration from the experiences and outlooks of their global colleagues in so many ways. Networking starts weeks before as attendees create their schedules and reach out to fellow attendees through the mobile app and online planner. Networking continues as they meet one-on-one at the poster fairs where they can spark discussion and learn about innovative ideas. Attendees also connect with each other every day at conference sessions, the guest speaker series, career center events, programming at the NAFSA Pavilion, and throughout the Expo Hall. 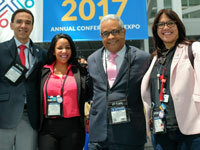 Altogether, the networking opportunities at the NAFSA Annual Conference & Expo yield professional and personal dividends for attendees that last throughout the year. 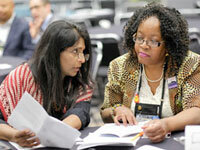 Explore dedicated networking events at NAFSA 2019. Strengthen your connections with colleagues and partners. Make deep connections within groups who share your interests.